Pre-drilled track fastening to suit 6mm (1/4″) countersunk fasteners at 100mm (3 15/16″) on center. Stop holes are 50mm (2″) on center. For 76mm (3″) car. Min horizontal ‘A’ curve radius = 350mm (14″). Min horizontal ‘B’ curve radius = 500mm (20″). For 157mm (6 3/16″) car. Min horizontal ‘A’ curve radius = 350mm (14″). Min horizontal ‘B’ curve radius = not suitable. Category: I-Beam - Series 19 & 32. 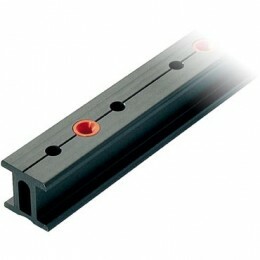 Ronstan I-Beam traveler systems deliver the performance required in a variety of applications and conditions. Ronstan systems have been put to the test under the most demanding conditions in the marine environment and in industrial applications around the world. Manufactured from extruded hard anodized aluminum alloy all track sections are available in multiple lengths. All track and Traveler systems can be curved for custom installs. Please note some sections are not available for purchase online. Please contact customer support for additional details.